If It's Too Loud...: Charming Disaster - "Be My Bride of Frankenstein"
It's October, which means it's now socially acceptable for there to be Halloween music! 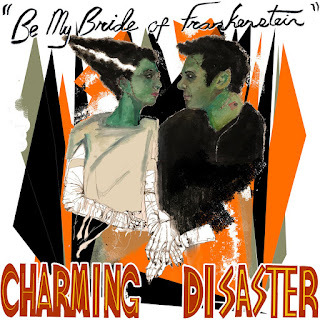 For some reason, very few bands actually make music for Halloween, which is why we're so excited about the new release from Charming Disaster. Although, it makes sense that Charming Disaster would release a Halloween song sinc according to their Bandcamp bio they " they write songs that tell stories about love, death, crime, ancient mythology, and the paranormal. ""Be My Bride of Frankenstein" is a brilliant retro rock throwback to when novelty songs were embraced. It's a groovy and goth romp, will brilliant lyrics like "I'm gonna love you though you're not so smart / Say I do and I'll give you my monster heart" and "Fire bad / Fire bad / Put away your pitchfork baby don't be mad." I wish more bands would release fun and silly songs like this. You can listen to "Be My Bride of Frankenstein" below. It will be included on a forthcoming Charming Disaster album. For more on Charming Disaster, check out their website.